LA PLANTA -1 DEL NOU EDIFICI DISSENY HUB BARCELONA ACULL LES OFICINES ADMINISTRATIVES, LES SALES POLIVALENTS DEL DHUB I EL PASSADÍS QUE LES SEPARA (ESPAI PER L’ACCIÓ). ELEMENT 2: ARMARIS DE FUSTA QUE EMMAGATZEMEN MOBILIARI PLEGABLE. L’ESPAI D’OFICINES ES CONCEP COM UN SOL ESPAI, AMPLI, TRANSPARENT I VARIABLE. ES DISSENYA UNA TAULA DE FORMA TRAPEZOÏDAL COM A ELEMENT UNITARI, QUE PERMET USAR-SE DE MANERA AUTÒNOMA PEL TREBALL INDIVIDUAL I AGREGAR-SE AMB ALTRES UNITATS FORMANT AGRUPACIONS PENSADES PEL TREBALL EN EQUIP. ES TRACTA D’UNA FORMA SIMPLE QUE S’AGRUPA CREANT FORMES POLIGONALS MÉS COMPLEXES SUGGERINT LA IMATGE GRÀFICA DINÀMICA, INNOVADORA I CREATIVA DEL DHUB. L’ESPAI ÉS FLEXIBLE, CREATIU i FUNCIONAL, AMB UN SOL MÒDUL S’ACONSEGUEIXEN INFINITES AGRUPACIONS I POSSIBILITATS FUNCIONALS D’ESPAI. ES SUBSTITUEIXEN ELS MURS D’OBRA PER TANCAMENTS DE VIDRE PER DOTAR DE LLUM NATURAL A L’ESPAI I D’AQUESTA MANERA TRANSFORMAR UN ESPAI DE TRANSIT AMB UN ESPAI D’ESTADA. AQUEST FET APORTA TRANSPARÈNCIA AFAVORINT LA CONNEXIÓ ENTRE ELS ESPAIS POLIVALENTS I LES OFICINES, VISUALMENT EN ALGUNS PUNTS I FÍSICAMENT EN D’ALTRES. SE SITUEN ARMARIS DE FUSTA PER EMMAGATZEMAR MOBILIARI PLEGABLE DE LES SALES POLIVALENTS I PER UTILITZAR COM ARXIU DE TREBALL PER LA XARXA DE COL·LABORADORS DEL DHUB. S’EQUIPEN AMB MOBILIARI PLEGABLE, APILABLE I LLEUGER, PER AFAVORIR LA MOBILITAT I FLEXIBILITAT DE LES SALES. PERMETENT QUE TOTES ELLES PUGUIN QUEDAR LLIURES DE MOBILIARI EN UN MOMENT DETERMINAT. LES SALES DOBLES ES DIVIDEIXEN AMB PANELLS MÒBILS ACÚSTICS QUE POSSIBILITEN LA SEPARACIÓ TOTAL ENTRE SALES. The -1 floor of the new Disseny Hub building in Barcelona contains the administrative offices, the polivalent rooms of dhub and the corridor that separates them (the action space). Element 1: glass coverings that contain the private spaces. Element 2: wooden cupboards for storing fold-away furniture. 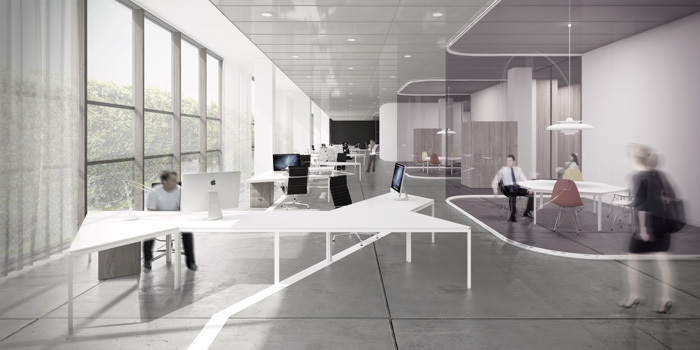 The office space is conceived as a single space that is wide, transparent and adaptable. A trapezoidal table is designed as a unifying element, which may be used alone for individual work as well as joined with other units to make larger groupings intended for work in teams. 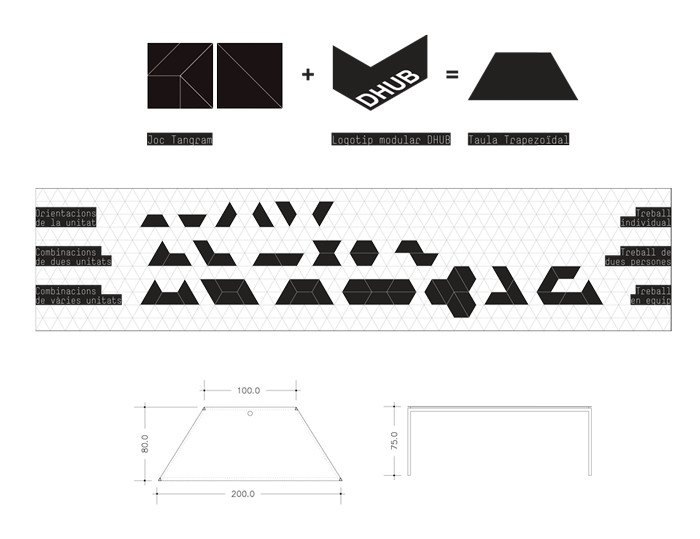 This simple shape can be put together with others to create more complex poligonal shapes that suggest the graphic image of Dhub: dynamic, innovative and creative. 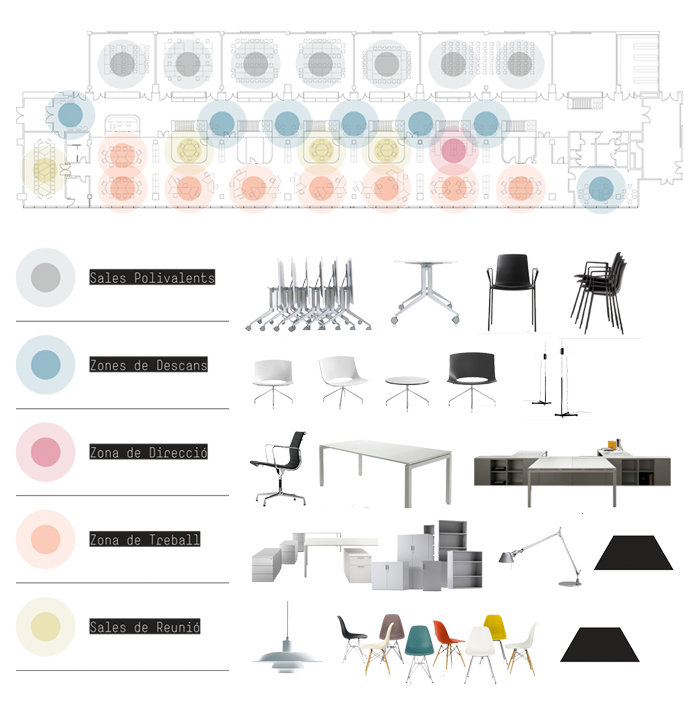 The space is flexible, creative and functional—with a single module, infinite groupings and functional possibilities of the space may be achieved. Masonry walls are substituted for glass ones to give natural light to the space and transform an area of transit into a living one. This offers transparency, improving the connections between the polivalent spaces and the offices, visually in some places, and physically in others. Wooden wardrobes are added to store the fold-away furniture of the polivalent rooms and to be used as work archives for the network of dhub collaborators. These are equipped with fold-away furniture which is stackable and light in order to facilitate the mobility and flexibility of the rooms. They allow all rooms to be free of furniture at any one time. The double rooms are divided by mobile acoustic panels that allow the complete separation of the rooms.